Baby Quilt Kit Giveaway at Weekend Kits! The August Craft Kit Giveaway has ended - be sure to check back for future giveaways! The winners of the August Craft Kit Giveaway are James-Linda and our updated winner Linda V. Congratulations to both winners! Please Contact Us with your shipping information and we'll have your prizes out to you right away. It's time for the August Craft Kit Giveaway at Weekend Kits. 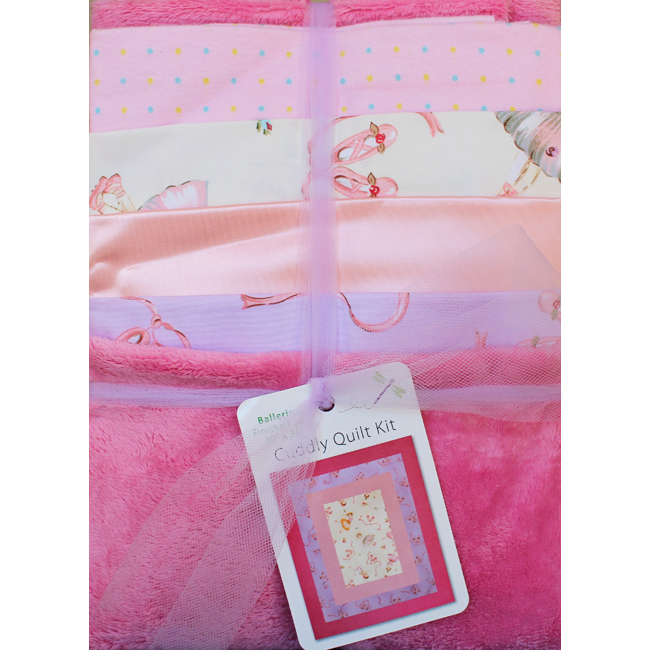 Two winners will be randomly selected to each win one ballet-themed Baby Quilt Kit plus one Warm & Natural craft size batting! 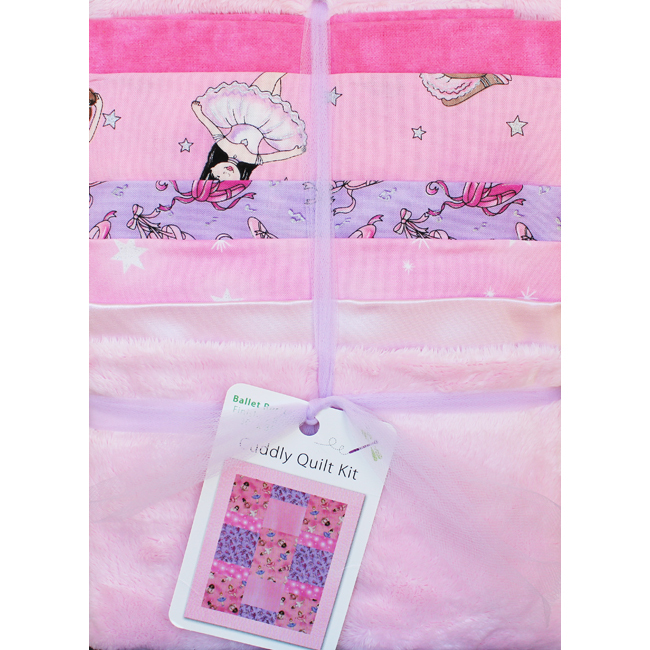 Cuddly Quilt Kits include a variety of fabric types, including textured plush, soft flannel, and premium cotton. 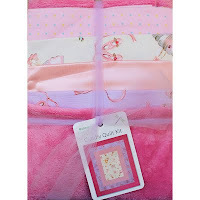 Each kit includes easy instructions and enough coordinating fabric to make one baby quilt. Visit the Baby Quilt Kits section of the store to see our complete selection of these soft quilt kits, including quilt kits for boys too! 1) Just leave a comment here on this blog post before the end of the day Monday, August 29, and you'll be entered to win! 2) Like us on Facebook and leave a comment here letting us know you did. If you already like us on Facebook, just leave a comment letting us know and this will count as a bonus entry. 3) Press the "Like" button at the top or bottom of this blog post and leave a comment letting us know you did. - You have until Monday, August 29 at 12:00pm (EDT) to enter. The winners will be announced here on Tuesday, August 30. We don't collect email contact info at time of entry, so it's important to check back here to see if you won. It might be helpful to add a reminder to your calendar. Updates are always posted on our Facebook page, so if you've joined us there, you're set! If you include email info in your profile or within your comment, we'll send you an email if you win. Winner will have 3 days to Contact Us with their shipping info to claim their prize. If not claimed within 3 days, a new winner will be drawn. Weekend Kits specializes in modern DIY craft kits for adults, teens, and kids. Our goal is to help make crafting convenient, easy, and most of all FUN for all skill levels. Good luck and thanks for visiting the Weekend Kits blog! 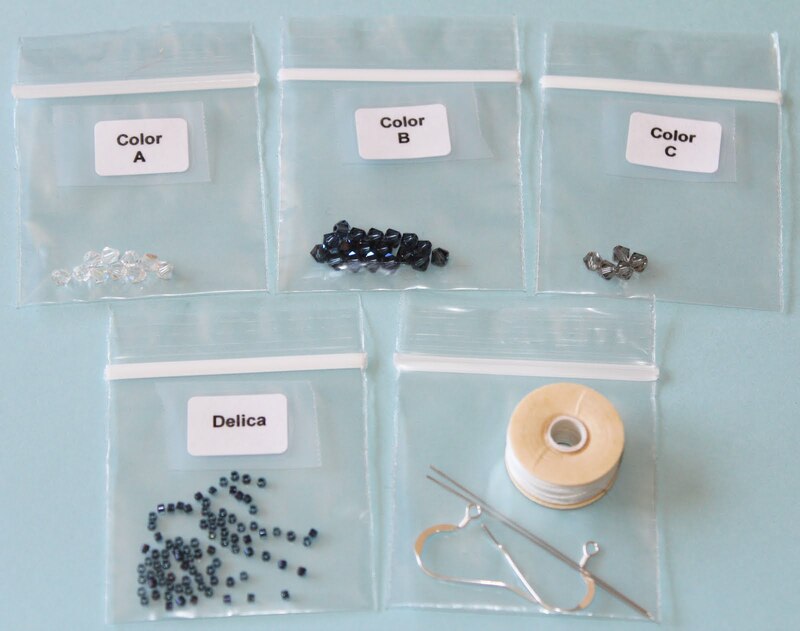 I'm excited to tell you about a new line of easy beginner kits in the Jewelry Making Kits section of the store. 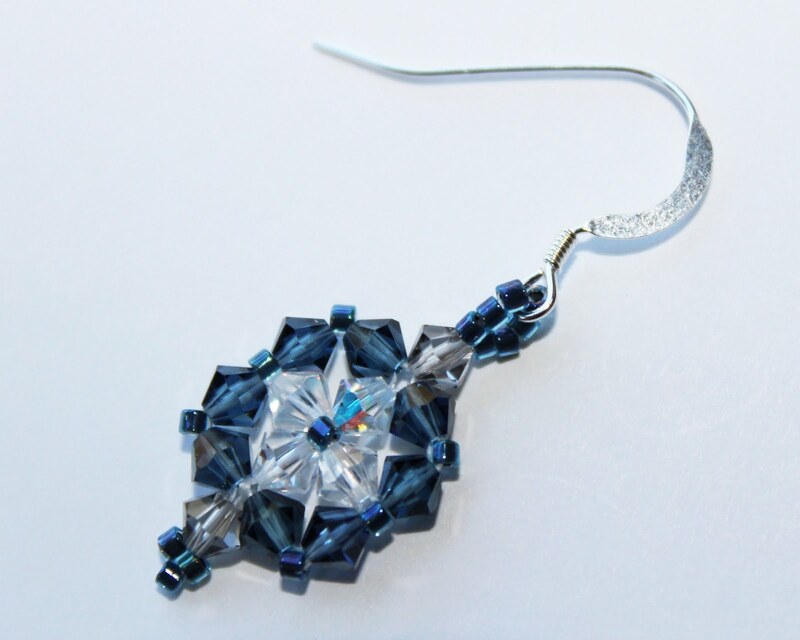 They're Crystal Earring Kits from BeadSphere and they're perfect for anyone interested in learning basic bead stitching techniques. Crystal earrings are a versatile jewelry accessory, perfect for a variety of occasions, ranging from everyday casual to evening formal. 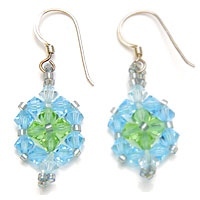 Wear these colorful crystal earrings to dress up a favorite pair of jeans or add sparkle to an elegant dress. Beadsphere earring making kits include plenty of beads & findings to make one pair of 1-1/2 inch Swarovski crystal earrings. Being a beginner bead stitcher, I decided to make a pair of these earrings to gain some basic bead stitching skills. I always like to be able to answer questions for any of the kits we offer in the store and this was the perfect opportunity to learn a new jewelry making skill and provide a closer preview of the kit at the same time. First, here's a look at everything you get in the kit. There's a generous amount of crystals & beads, so there's no worries about not having enough. I was especially impressed with how neatly the beads & findings were organized and labeled for easy identification. It was really nice to not have to sort through a mixture of beads just to get started. All of the kit contents are presorted and ready to go! The instructions included with the Crystal Earring Kits deserve a special mention. Beginner bead stitchers will greatly appreciate the detailed step-by-step procedures and color diagrams. You'll only need to have a pair of scissors on hand for cutting thread. Running the thread through wax or a thread conditioner is optional but recommended for added strength and smoother bead stringing. Being partial to everything blue, I made the Montana Blue earrings. Thanks to super-clear directions and detailed diagrams, I was able to follow along each step of the jewelry making process without any problems. The beading needles have a tiny eye, so be prepared with good lighting. Once you have your needle threaded, you'll find that it's very flexible and glides easily through the beads. I used a thread conditioner and believe it not only made for smoother stringing, but helped prevent tangling too. 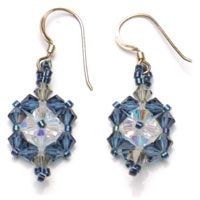 This is an excellent jewelry making kit for beginners to learn about bead stitching and make a set of sparkling crystal earrings in the process. Your finished earrings will be lovely to wear and perfect for handmade gift giving too! I had a lot of fun with this earring making project and was very happy with how they turned out. Here's a snapshot of one of my finished earrings. Click on the image to enlarge for a closer look. 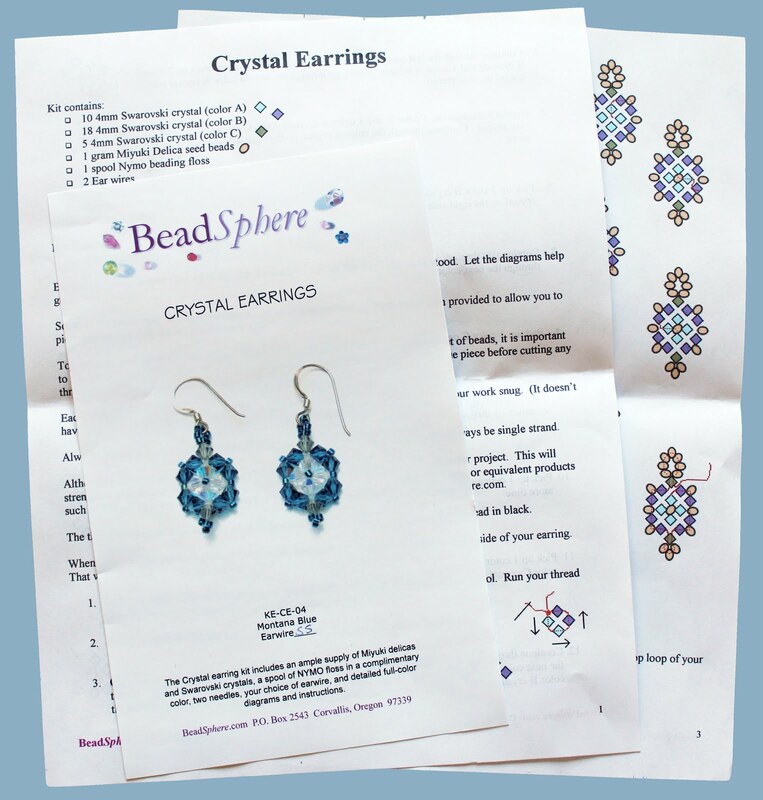 Visit the Jewelry Making Kits section for details on the new Crystal Earring Kits from Beadsphere and to see our complete selection of beaded jewelry kits for beginners and experienced crafters too. 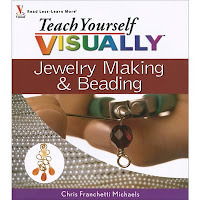 If you're new to jewelry making and would like to learn more, the Teach Yourself Visually Jewelry Making & Beading Book by Chris Franchetti Michaels is an excellent beginner's guide. 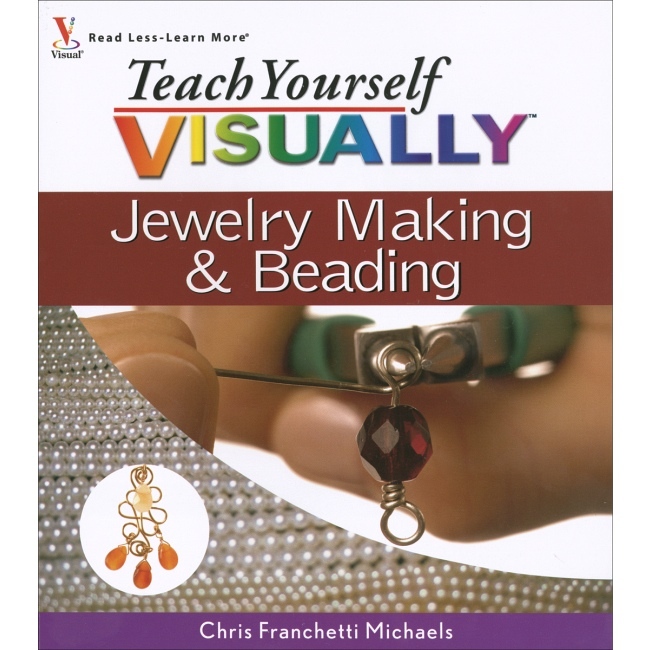 This book covers a wide range of jewelry making techniques, including bead stringing, weaving, wirework, and much more. You'll learn how to make jewelry with the help of step-by-step instructions, detailed color photos, and helpful tips throughout! 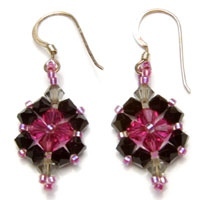 It also includes a variety of beginner & intermediate level jewelry projects to get you started. Weekend Kits offers a modern selection of Creative Craft Kits for adults, teens, and kids. Stop by today and be ready to learn a new skill, like bead stitching, on your next Weekend at Home. Thanks for visiting! 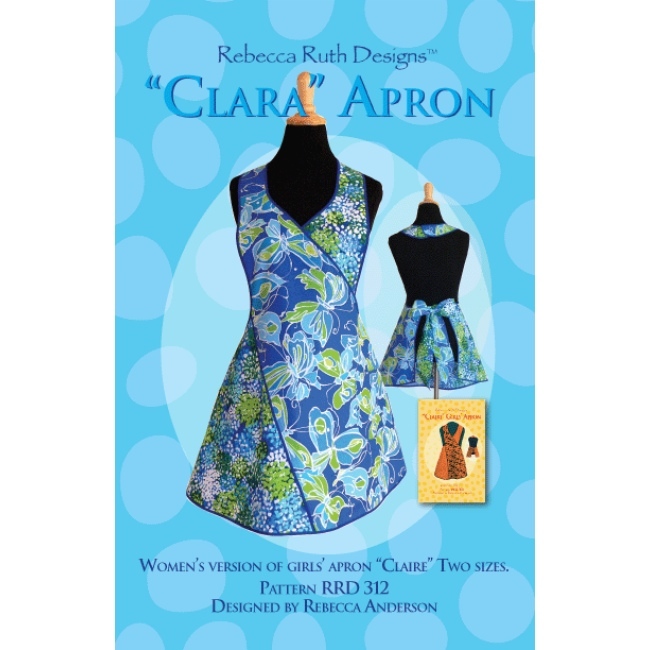 If you love making aprons to wear & share, you won't want to miss our newest selection of apron patterns from Rebecca Ruth Designs. There are 6 new Chic & Retro Aprons in the line up, all designed by independent pattern designer Rebecca Anderson. You'll find them in the Apron Patterns section of the store! The Clara Apron Pattern is one of my new favorites. It's a flattering crossover style apron design that ties in the back with a pretty bow. I can imagine how cute this apron would be made up in the latest holiday themed fabrics. Perfect for handmade gift giving! 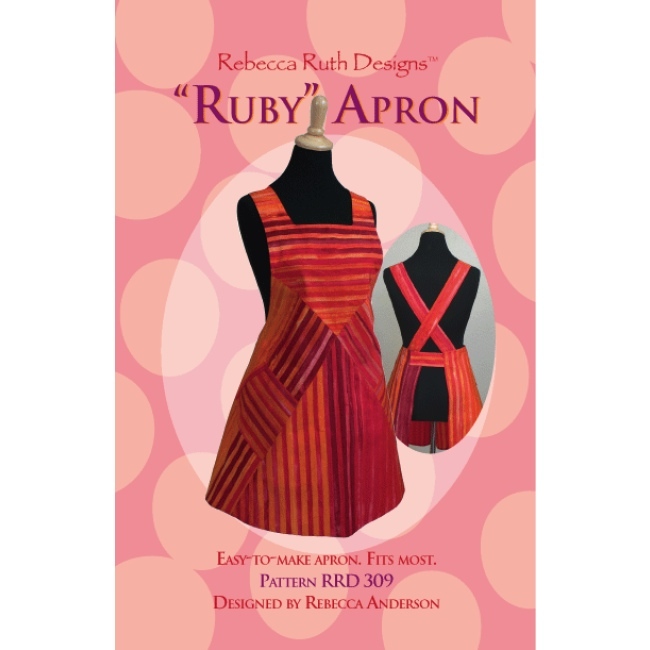 Rebecca's apron patterns include clear and complete instructions with color illustrations. Patterns are designed to fit most sizes. Aprons are an ideal sewing project for beginners & busy crafters. They typically have minimal pattern pieces, simple sewing construction, and an easy adjustable fit. The Ruby Apron Pattern is a chic bib style apron design that's easy to sew and fun to wear! It's such a pretty apron design. The classic A-line skirt flatters most body types and I really like the look of how the shoulder straps cross over in the back. Full size pattern pieces are boldly printed on quality white paper stock for lasting value. This is especially nice if you plan to make multiple aprons from one pattern. Pattern includes woman's sizes small, medium, and large. There's also an option for making it a reversible apron. 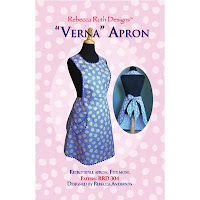 The Verna Apron Pattern is a lovely retro style apron design. Perfect for those wonderful 1930's reproduction fabrics! The retro look is enhanced by coordinating rick rack trim along the hem, bib, and pocket. Tips for working with rick rack are included in the instructions. An attractive apron design with classic retro appeal. Pattern includes woman's sizes medium and large, designed to fit most. 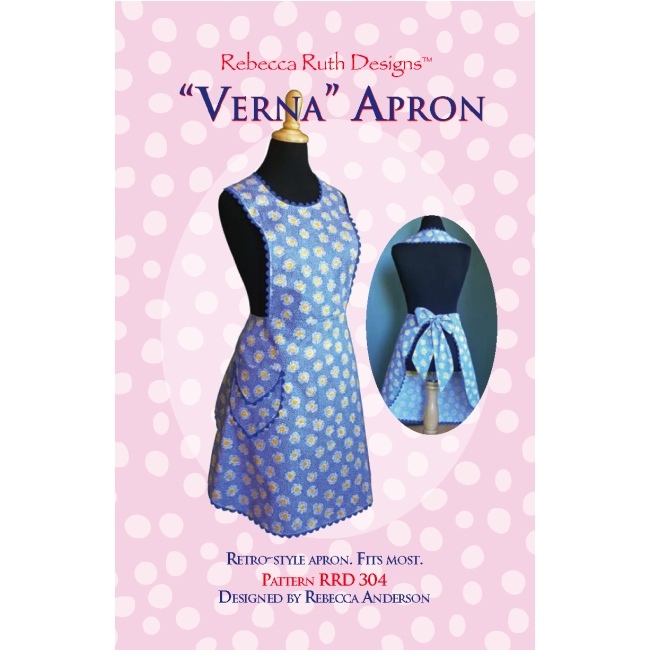 Be sure to visit the Apron Patterns section for details on all 6 new apron patterns from Rebecca Ruth Designs and to see our complete selection of apron patterns. You'll find a wide range of fun apron styles from the best apron designers. Weekend Kits offers a unique selection of modern Art & Craft Kits for adults, teens, and kids. It's the perfect place to find inspiration for your next creative project. Stop by today and be ready to start creating on your next Weekend at Home. Super-Fun Craft Kits for Kids & Teens! We have a new selection of Klutz Craft Kits in the store! These super-fun craft kits are perfect for kids & teens looking for creative ways to spend free time. I'm a big fan of the Klutz brand craft kits for kids and beginners of all ages. They include well-written instruction books and the supplies you need to get started. I'm always impressed by the clarity and thoroughness of the Klutz book instructions, which to me is one of the most important aspects of any craft kit. The books are done in full color with beautiful illustrations and photos throughout. Step-by-step procedures and diagrams make it easy to learn new creative skills with confidence! You'll find them all in the Kid's Craft Kits section of the store. 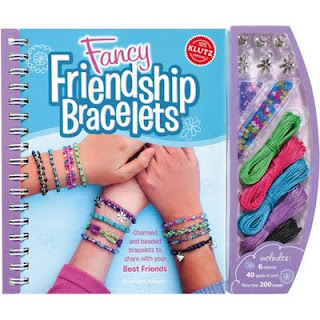 The new Fancy Friendship Bracelets Kit is a fun jewelry kit for kids & teens with instructions for making 10 unique fancy bracelet designs. 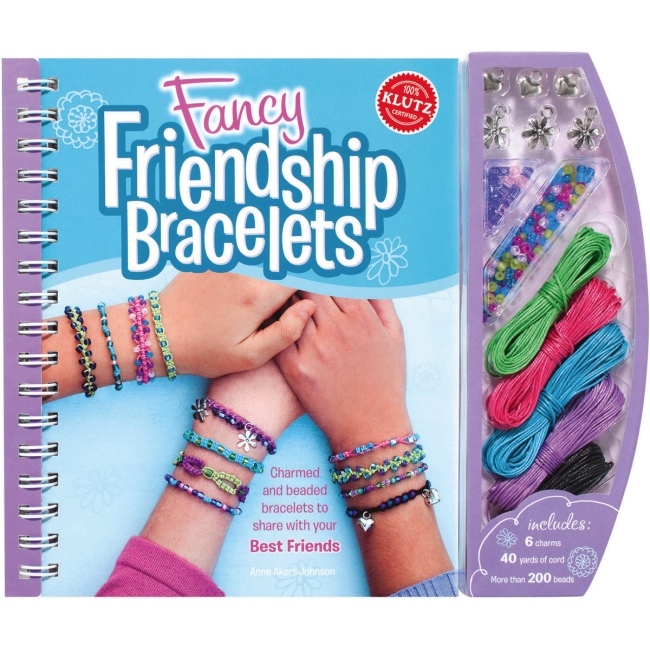 Kit includes a 60-page instruction book, 6 pretty charms, 40 yards of colorful cord, and more than 200 sparkling beads. Everything you need to start making charmed & beaded friendship bracelets! Bracelet making is a fun craft activity for friends to do together. Kids will enjoy spending creative time making fancy friendship bracelets they can wear and share with best friends & family. 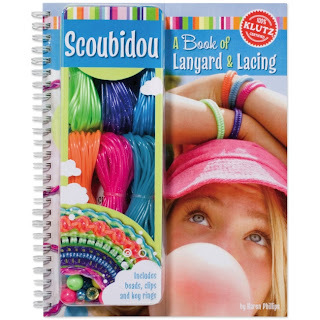 The Scoubidou Lanyard & Lacing Kit is an amazing craft kit for kids & teens to make a variety of creative craft projects, including bracelets, key chains, lanyards, ponytail holders, and more. 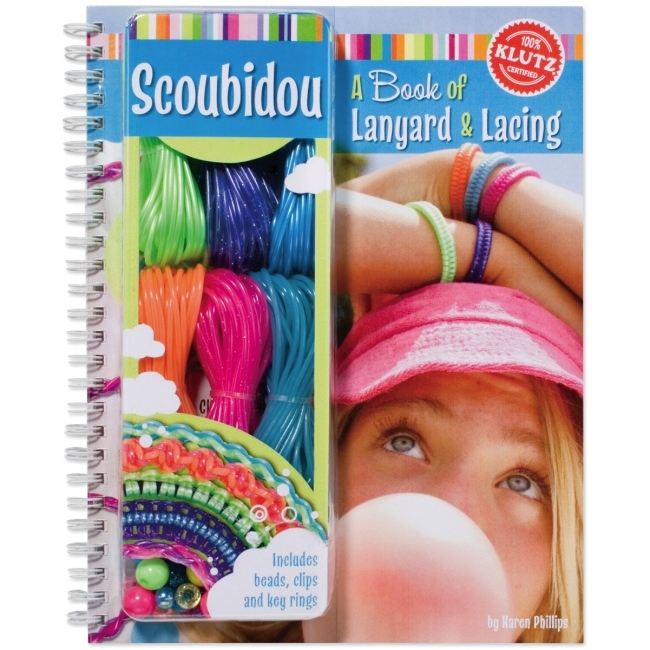 Kit includes a 52-page book of lanyard & lacing, Scoubidou cord in 6 bright colors, assorted beads, lanyard clips, and key rings. Filled with enough supplies to make every project in the book! The Scoubidou cord is easy & fun to work with and it comes in three finishes: glitter, glow-in-the-dark, and pearl. The book provides super-clear instructions with beautiful color graphics & photos. 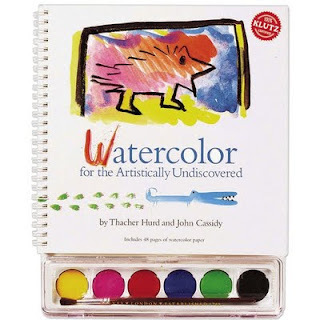 The Watercolor Painting Kit for the Artistically Undiscovered is a wonderful art for kids & teens to learn how to paint with watercolors. Adult beginners will love this too! 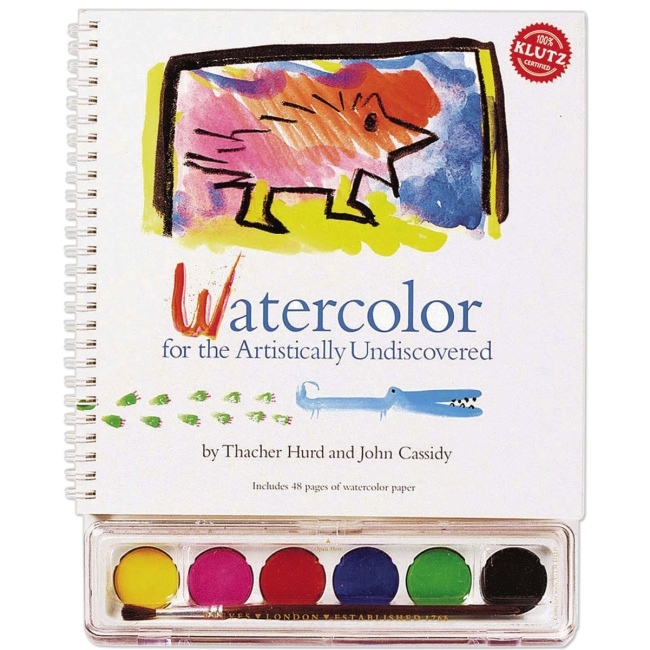 Kit includes a 72-page watercolor painting book, artist-quality watercolors, and a paintbrush. A great feature of this kit is that there are 48 pages of actual watercolor paper throughout the book with space for you to practice your new painting skills. Creative illustrations, helpful examples, and encouraging words help beginners gain confidence in their unique artistic abilities. Discover your inner artist as you learn basic watercolor painting techniques! Visit the Kid's Craft Kits section for details on these kits and to see our complete selection of Klutz craft kits for beginners of all ages. Weekend Kits specializes in modern Art & Craft Kits for kids, teens, and adults. Our goal is to help make crafting convenient, easy, and most of all FUN for all skill levels! Stop by today & be ready to learn a new creative skill on your next Weekend at Home.